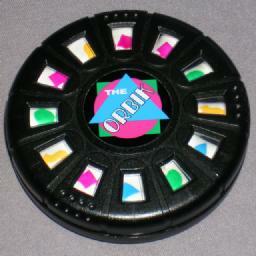 The Orbik is a fairly rare puzzle. It is a black disk, about 7 cm diameter, which has 12 small windows arranged around the front face of the disk. Behind each window is a small drum wheel that shows one of four coloured shapes - a red square, a green oval, a blue triangle, or a yellow wave. When you turn the front face of the disk clockwise, three of the drum wheels will advance once, showing the next coloured shape. Three of the windows are marked with dots, to indicate that they are the ones that will change. If you turn the front face anti-clockwise no changes occur, except of course that the marked windows will have moved to different positions. The aim is of course to get all the windows to show the same coloured shape. There is a sticker in the centre of the front face, bearing a triangular logo. If you hold it so that the triangle points upwards, and think of the front as a clock face, then the three marked windows lie at 12 o'clock, 3 o'clock, and 7 o'clock. The Orbik was invented by Shih-Hung Juang, and has patent US 4,752,074 filed 25 September 1986, granted 21 June 1988 (also European patent EP 262,251). The Orbik I have is one (of about 200?) that the late Edward Hordern brought to the 1992 International Puzzle Party as exchange gifts. Later the puzzle was distributed for a while by James Dalgety. The Orbik has 12 wheels, each with 4 possible states. It is possible to change a wheel without affecting any others, so the number of positions is 412 = 16,777,216. I have used a computer to calculate God's Algorithm. The results are in the three tables below. Each table uses a different definition of what constitutes a single move. The mathematical theory that lies behind this puzzle is linear algebra. If you think of a move as a clockwise turn of one step, then there are twelve possible moves you can do (as there are 12 ways the marked windows can be arranged). The order in which these moves are done does not matter, and so linear algebra can be applied to solve it just like the Lights Out or Rubik's Clock. See the Mathematics of Lights Out for details. The solution below is loosely based on Hordern's solution, published in CFF 29. In some of the steps below I shall use the letters A and C to denote anti-clockwise and clockwise twists respectively, always followed by a number to indicate how many steps to move in that direction. Choose one of the four colours. You will try to make all the wheels show this colour. In the rest of the solution I will assume you chose red. 1. Three wheels, of which two have the same non-red colour (the third may be red). 2. Three wheels, all different non-red colours. Rotate the windows clockwise one step, and then anti-clockwise one step (i.e. do the moves C1 A1). This should have changed all three marked windows. In case 1, repeat step c until the pair of equal wheels both show red. This will then have increased the number of windows showing red. In case 2, a single application of step c will have turned a wheel red. Repeat steps b-d as often as possible. Eventually, when only about 4 non-red wheels remain, step b is no longer possible. Hold the puzzle with incorrect wheel at the 4 o'clock position, and turn anti-clockwise until the front logo is upright, so that the marked windows are at 12, 3, and 7 o'clock. Repeat f-h for each incorrect wheel.